Subway Surfers v1.100.0 Mod apk for Android. Subway Surfers is the most Loved, Played & Downloaded Game on Android. 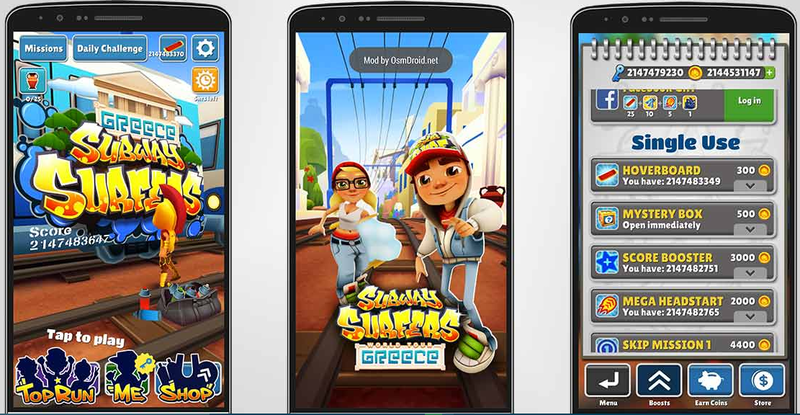 Subway Surfers World Tour to Greece is here. Help Jake, Tricky & Fresh escape from the grumpy Inspector and his dog. Subway Surfers is by Kiloo Games and Sybo Games. Click install , Enjoy the Game! – Unlock, and activate all Characters , and Boards. – Score X100, Double score active. – Hoverboard Reactivate time set to 0s. – Rescue key used set to 0. – Score X850, Double score active. – Score X950, Double score active. – Score X1000, Double score active. It is possible to have the V4 pliz ? Update on Last day on esrth!!!!! Can you guys please update Last day On Earth? Unlimited keys, but we cant use it if get caught. Then what’s the use of having unlimited keys? Are you gonna update the mod too?